When it’s a timepiece. The word “clock” was derived from the Dutch word “glock” which means bell. The term clock was then applied to those timepieces which “struck a bell”. Therefore “clocks” that do not strike or chime are technically called timepieces. What do the words “Tempus Fugit” mean on a clock dial? Many people mistake these words for the brand name of their clock, when in reality it is a Latin phrase which means “time flies”. Did you know that the <?xml:namespace prefix = st1 ns = "urn:schemas-microsoft-com:office:smarttags" />Westminster chime has words that go along with the melody? Why do they call it a “grandfather clock”? In the earliest days of clock making, the clock’s movement was cased in a small “box” with a dial on the front and was made to be hung on the wall where the pendulum and weights were hanging free in the open air. With nothing to protect the pendulum it could easily be upset by a breeze and the clock would stop. Eventually they began to build cabinets around the pendulum and weights in order to protect them. These clocks were then able to stand on the floor without being hung and were termed tall case, hall or floor clocks. In fact the song was so popular that a few years later a sequel was written by the original composer and was titled, “Sequel to Grandfather’s Clock.” In the sequel we are told of the clock’s sad ending. The grandson upon returning to his grandfather’s house, which is now owned by others, learns of its fate. The clock having not run since his grandfather’s death was traded in for another clock which was hung on the wall in its place. The clock peddler took the clock to a junk shop where its parts were melted down. The case was then chopped into kindling by the junk-dealer’s wife; a sad ending indeed. I guess there weren’t any good clockmakers around! Ever wonder why some clock dials with Roman numerals use “IIII” instead of the correct form of the number 4 which is “IV”. Many early clockmakers noticed that within the ring of numerals on a clock dial the Roman number four written as IIII presented a better balance than when written as IV. The balance referred to the VIII for the eight on the other side of the dial. Everyone to come along afterwards must have agreed as this custom has continued to be a preference. Historically, the ability to measure time with an increasing degree of accuracy has been so great that for centuries, clockwork was by far man’s most sophisticated invention. What Henry Ford was to cars, Eli Terry was to clocks? Long before Henry Ford began the process of building cars with an assembly line, Eli Terry began to mass produce clocks using similar methods. 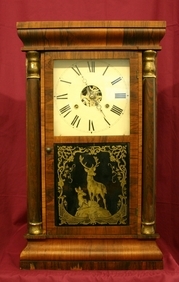 Up until about 1805 clocks were costly masterpieces. They were mostly handmade-to-order luxuries for only a wealthy few. A master clockmaker would make a clock as a model and then his apprentices would use this as a pattern. Manufacturing the parts one at a time in this manner often caused the same parts to be slightly different. These minor differences kept the parts from being interchangeable. Eli Terry shattered tradition by beginning work on clocks for which no one had ordered. He reasoned that in making them in this manner he could produce them cheaper and he would therefore be able to find a broader market for them. 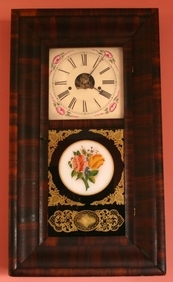 Some of his earliest clocks made in this manner sold for about $25. Even these were too expensive for some and he began to sell them on time-payments. In 1807 Terry shocked a great many clockmakers when he announced that he would begin work on 500 clock movements to be sold at $5. They did not believe it possible. As it turns out, over the next three years he produced 5,000 clock movements.